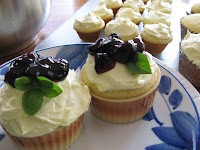 The Un-Official Blog of Romance Author Maddie James: Iron Cupcake -- Basil! I've recently discovered a new project venue. It's a fun little project that quickly could become all consuming. I know, that's dangerous, right? I learned about it from a co-worker whose daughter had participated in this contest last month. 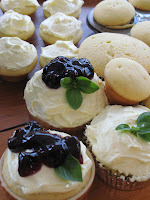 The name intrigued me -- the Iron Cupcake Challenge. Now, as previously declaired, I'm a Food Network junky and yeah, I've watched more than my share of Iron Chef, Japan and America. But Iron Cupcake? This was a new one on me and so, well, I had to do the Google and check it out. Now, I'm an Iron Cupcake baker. I'm about to enter my first contest. This month the secret ingredient is Basil. That's right, basil. In a cupcake. But like their mantra says, these are not your momma's cupcakes. So yesterday, I baked. I created the recipe, snipped the basil from my backyard, and went for it. I didn't even shop. I used what was on hand in the pantry (fortunately, I had just stocked up a week ago as the pantry was getting mighty low there for a while) and set out on my quest. I decided not to go wild and crazy. My brain immediately went to lemon and blueberries, for some reason. 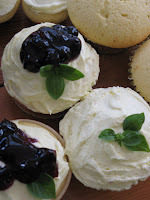 So here we have, Lemon-Basil Cupcakes with Lemon-Buttercream Frosting and Blueberry Sauce. Here is the official photo I'm posting for the contest. And here are a couple of others. Mouth watering yet? I hope so. Tomorrow I'm off to work in South Dakota for a few days. Hope to be able to bring you some interesting posts while on the road. Talk soon! Wow! This is definitely one of my two favourite entries. My Backyard Garden - Herbs!! !